Give Back Bingo Mobile | Claim 150% Bonus + 20 FREE Spins Here! Is there anything more fun than playing online bingo games? Well, how about playing bingo while giving to charity? Players can head on over to Give Back Bingo who give back to charity every time you play! Players can feel good while playing exciting games and taking part in fantastic promotions and be rid of that guilty feeling as the money is going to a good cause. Plus there is a 150% match bonus worth up to £150 to be claimed! 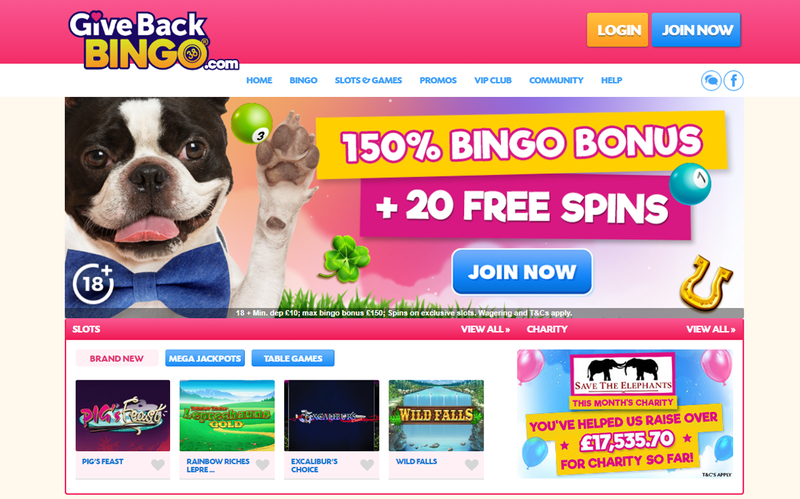 Sign up to Give Back Bingo today and this charitable site will award you with a 150% first deposit welcome bonus. The minimum deposit required is £10 to claim this offer and doing so will give you £15 extra and a total of £25 to play. The fun doesn’t stop there though, you will also get an additional 20 free spins to use on exclusive slots. Other perks include a rewarding follow-up bonus on your second and third deposit. Over both of these deposits, you will get a 50% match bonus. Give Back Bingo does not feature a mobile app for players to download but you can still access many terrific games from your mobile browser. 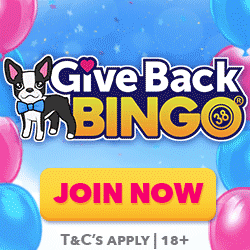 Type www.givebackbingo.com into your mobile browser and log in as you normally would to get started playing lots of exciting bingo and slots games. The mobile version works on both Android and iOS, so virtually all devices should be compatible. Homepage Screenshot: Featuring welcome offer and top games. At Give Back Bingo, you will find lots of exciting 90 ball and 75 ball bingo games plus a few games of 5 line bingo. There is also plenty of free bingo to play at this too. No matter what your budget is, everyone can enjoy the vast range of games that are on offer here as bingo ticket prices start at just 1p, however, the bigger jackpot games have ticket prices up to £1. You can pre-buy their tickets from the bingo lobby to ensure that they are ready to play and win lots of big cash prizes. Players will find hundreds of games to choose from at Give Back Bingo, including many of the most popular titles on the web. Just a few of the big titles that you will find here include Aloha! Cluster Pays, Starburst, Irish Luck, Rainbow Riches Pick N Mix, Fluffy Favourites, Spinata Grande, Twinkle, Siberian Storm, Jungle Spirit Call of the Wild and Bar Bar Black Sheep. If you enjoy scratch card games you will find a few to choose from at this site including Word Candy, Scratch 4 Gold, Viking Runecraft and Rocket Returns. Table games are slightly more limited at this site, but you will still find a few. There is European Roulette, Jacks or Better and Deuces Wild plus more. We really love the giving concept and it is hard to fault this site based on that. If you want to feel good while playing bingo then this is certainly the site for you and we don’t think you will be disappointed by the wide range of games and promotions that are on offer plus the huge welcome package is fantastic. Get started today and you can claim up to £150 in bonus cash with the 150% match bonus. Also, don't forget they will sweeten the deal ever so slightly and also give you 20 extra spins on slots when you first become funded. All things considered, this is a lovely and enjoyable bingo site to play on.